I’ve come late to this cucumber party. I don’t just mean that I’m finishing up this post at nearly midnight. I mean that, for decades, I steadfastly refused to eat cucumbers. Their slippery innards kind of grossed me out. The seeds slid around my tongue when I took a bite  ugh. The outside is crisp, the inside is mush. I wanted nothing to do with them. Even when my best friend Sharon suggested we put together a high tea for ourselves and make cucumber sandwiches on soft white bread with the crusts cut off, I ate them just to amuse her. Really, I hated cucumbers. The other is that I realized I spent most of my life eating old cucumbers. The ones in the grocery store any month other than June, July, and August are pretty awful. 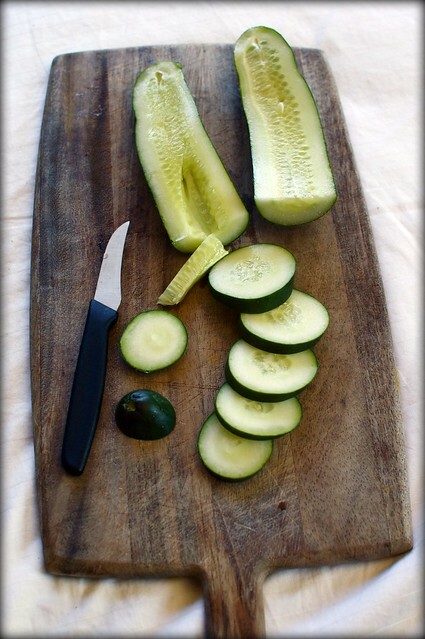 Try to slice one open and you’ll feel the cucumber bend under the knife. You have to hack at it to get one piece free. How does that taste on the tongue? Pillowy and crumpled into itself, like an old man without teeth. I have to be honest. My attempt at growing cucumbers was a big old failure this year. The deer ate them all, it turns out, along with the lettuce, the arugula, the spinach, the strawberries, the red currants, and most of the herbs. However, the farm stand just down the street from us sells glossy green cucumbers in their refrigerated case. We like our farmers. We’re happy to give them money for what the deer took away from us. Now that I’ve joined the ranks of cucumber lovers, I can’t get enough of them. Bring me crisp cucumbers on a plate and I will eat them up. Cooking Channel TV delves into zucchinis versatility. Food Network Dish is loving Paula Deens zucchini bread. Food Networks HealthyEats talks cuke salad and lighter cuke/zuke ideas. Kelly Senyei of Just a Taste says its nonstop cucumber and sesame salad. Late last night, while Jon Stewart was talking, Danny threw this together, adding a bit of his own flair, of course. Our friends Diane and Todd were sitting on our couch, working on matching laptops, while Danny threw the dill into the blender. “That smells good,” Todd said, looking up. “That smells really good,” Diane said a few moments later, craning her neck to see what was going on. When it was done, I ran a full spoon over to them both and gave them a taste. That’s right. I made cucumber soup popsicles. They’re utterly unexpected and fantastic. Imagine the hottest day of the year (that might be today for some of you). Now imagine sucking on a cool cucumber popsicle with sprigs of dill tickling your tongue. You don’t want to miss these. p.s. Diane and Todd are marvelous teachers, kind-hearted people, and some of the best folks we know. We’ll tell you more about why they were here, soon. I just wanted to say that it was Diane’s insightful suggestions, and smart styling, that allowed me to take these photographs. lovely shauna!!! the popsicle twist is really nice- of course today it is pouring rain and chilly here– will save for later! Two: cucumber soup pops? BRILLIANT! Not only b/c they sound delicious, but also b/c I love the idea of also serving them to kids. So fun to give them–and see their reactions to–unexpected (in a good way) foods. Keeps things fun, delicious and challenges their notions about food, esp veggies. Love it. I add soda water to my cucumber soup as well – makes it effervescent! Cucumber soup is one of my favorites. Glad you like cucumbers now. Have you tried adding a few slices to your water? Amazing! I love cukes. Booth only likes them if I cut the seeds out. I've been making a cucumber gin drink with lime juice and simple syrup- super refreshing- and beautiful color… but with salmon in season, I'm making a variation of a Rick Moonen recipe: Lapsang Souchong tea cured salmon with dilled horseradish creme fraîche on a cucumber salad. I'm telling you–if you try these, you will not be disappointed. But you may get mad at me for the ensuing obsession. funny how we all have our little food quirks – me + celery? not so much. We've had an abundance of both cucumbers and summer squash in our CSA and our garden is about to go crazy (provided the squirrels don't wipe us out – the battle is getting heated). love the cucumber soup pops – brilliant! Ice box pickles and Zucchini Ribbons in a Hazelnut butter sauce. 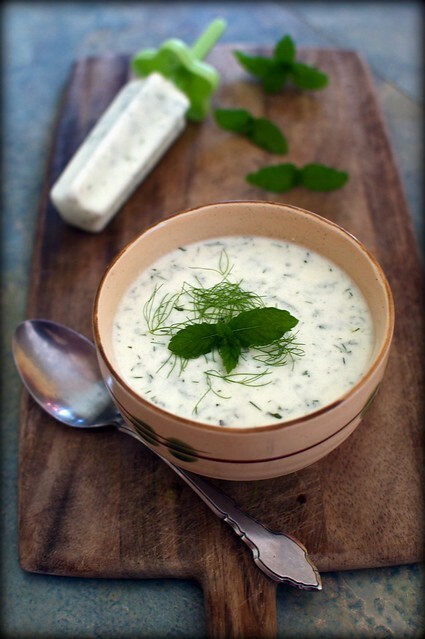 I'm all about chilled cucumber soup this summer – just wish we had a few more hot days to really warrant it! Ah well, at least it's not raining… I've been making a version that I drizzle with some curry-infused olive oil. It's terrific. And I have yet to have any luck growing cukes this year or any year… and I can't blame deer! They just don't seem to ever take off. To love someone in such a way that you want to enjoy all the foods he enjoys — even the ones you thought were icky — is a wonderful thing. One of my favorite refreshing drinks – put cucumber slices and lime slices in a pitcher, fill with ice and water, let seep for a few minutes and enjoy! This sounds delicious, but I am wondering if it really needs full fat yogurt? I just can’t afford the fat and calories. Could you use 2% greek yogurt? Thank you for this post! I too have a love hate relationship with this vibrant summer vegetable. Im always trying to find ways to TRY to enjoy it. I was at the market yesterday and picked up some fresh crisp cukes and radishes and a flat of very delicious berries feeling inspired by the warmth in the PNW. So this morning I woke up and got to work. I surprised my cucumber loving honey with this soup today along with some fresh baked gf bread & butter with radishes mmmm. The soup was terrific! And my sweetheart finished hers off and looked at me wide eyed asking if there was any more. It was a hit! Thanks for being fantastic!